AM 46º and a very clear early morning. Bright stars were out. Just a easy 7.42. PM 55 and a short run with some easy striders. 2 Weeks until my 1st marathon since 2013. 1st time I am running pain free this close to a marathon since 2010. Extememly thankful. I am trying not to get hung up on anything and just enjoy it, but dang it I like to hit goals. Anyway, 38º and a very cold brisk wind. 2 Mile warm up. 12.1 consecuative miles faster than BQMP- 7:50, 7:29, 7:42, 7:35, 7:41, 7:33, 7:47, 7:45, 7:42, 7:40, 7:47, 7:13. Considering the hills and wind I am good with the effort and resutls. 37 and snow flurries. Cold wind, easy run. Starting the slow/slight taper. 26 and cold. Had to pull out some running pants. Thought I was done with that for they year. 9 Striders @ 30s. 5K pace. 45 and raining. Wind was a factor again and down trees. Easy run. a crisp 28º. Easy run with 11x20s striders @ 3-5k pace. Through the neighborhood and when i went by the speedway the delivery driver stopped me for a moment. Said I see you everyday at all times of the morning. Was neat. I mean in a non stalker way. 26º with a 12º WC. 20 mph wind sustained, it was quite crisp. light snow last night and this morning left a nice icy run. No one else out today at all. By the end the sun was out and removed enough ice despite the cold to finish with some bqmp miles. Glad it is taper week. 7 Days to race. Crisp 32º, but the sun was coming up and it was a calm morning. Just ran 4 sub MP to keep my legs reminded that I will need them soon. Long day of work ahead. Afternoon, 57º and feelin fine. Sat forecast is 46 for race start.... I keep checking! Happy to be back with my 1st marathon since 2013… even if the results were depressing at best. The 2 miles on Friday felt very nice and although the forecast was slightly warmer than I would like I felt confident going in. Slept well, morning coffee and oatmeal are my standard long run/race meals. Shuttled over to the race area around 7 and felt a little anxious, but still felt a solid race was in me. Judging by the course I was planning a slight positive split. Nothing crazy, but miles 3-9 are slightly downhill and 9-20 slightly uphill. I figured with that and increasing temps it was a good idea to go out a hair faster. I was aiming for a 3:20-3:23 marathon. The half marathoners started at the same time as the marathoners and broke off at mile 4. This lead to a congested, slow start and I felt like I had to weave too much early on. Miles 1-5 7:38, 7:31, 7:38, 7:27, 7:45 Felt pretty decent, could see the 3:15 group in the distance so things seemed like they might go according to plan. Miles 6-10 7:37, 7:39, 7:36, 7:39, 7:48 On to some bike paths and heading into mile 10 was a little more up than I realized. All good though. Miles 11-15 7:43, 7:40, 7:43, 7:52, 7:38 I choked on some gu at mile 14. Took me a few seconds to wash it down- I also noticed although I was running at the same effort my times were going up. I know it was gradually uphill, but it bothered me. It was starting to break 60-65 at this point in temps. 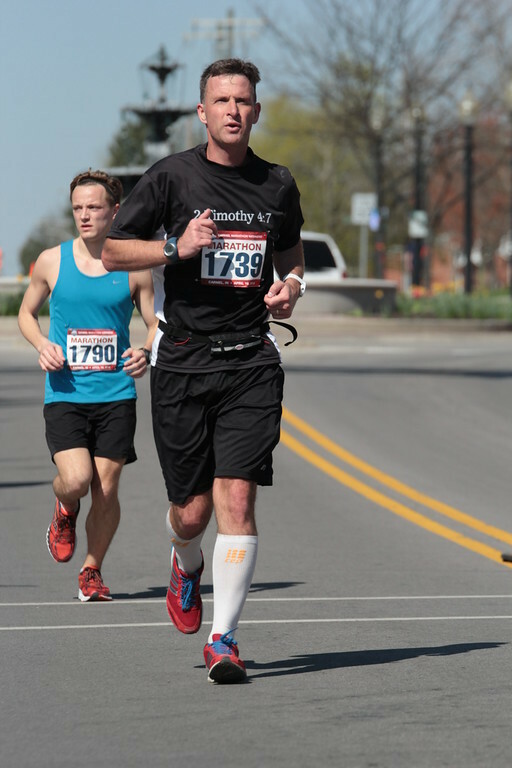 Miles 16-18 7:50, 8:03, 8:18….. 8 freaking 18… I was not happy at this point. The effort was there, but the time was slipping away. This may be a surprise, but I have never really ‘bonked’ in a marathon. I mean maybe the 1st one I ever ran, but I had no clue what I was doing then. Miles 19-20 8:26, 8:32 As I was passing mile 20 I was convincing myself I could still rally back. I was getting hot, but I had fueled smart and knew I could just hold on. I picked out a person and ran with them…. Oh for about half a mile and then I felt… heavy is the best way to describe it. So there it was. 3:35. It was warm. I was being congratulated while I was fighting back tears. Yes I am man enough to admit that. For the first time other than injury I was ready to cry after a race. After a few minutes went by I sucked it up and started to practice what I preach. The only thing I can change at this point was my attitude. I just ran 26.2 miles injury free. I do not do as well because I did not train enough mainly because I have not raced in so long. It was then that I was thankful to God for allowing me even get back to the starting line. To be blessed to even have the means to do such things. To have support of a few good friends and even one on here texting to see how I was. In that light, I am pretty darn happy. God willing and body able, I will push. I mean when I can walk normal again… soon. On the road. 1 Mile in Kokomo. Legs trashed, not ready. Much better. Legs still fatigued, but not hurting. 8:38 ap. 60/78%/53- A bit humid, but overall okay running weather. 6 Miles around the block. Legs feeling better. Nagging shoulder/neck pain. I think I just slept odd. 8:31 ap. Looking at some new training runs to throw in this spring/summer. I am open to ideas for mid week cruelty. Daughter had theater, Mary Poppins. They were fantastic! I could only squeeze in 3 miles today. 50º this morning. Time to start training again. I would like a quick turn around before racing again. Good morning run, easy. Lots of multicolored squirrels and a baby bunny tagged along today. 66, a bit warm. Windy. 8+ miles. Striders 11x30s @ 5K pace- active recovery. Started just a hair later than normal so I had to weave the kids walking to school. Made me feel like it was a real 5 K.
Had my doc in the am and some good adjustments felt so nice. 9.25 evening. Ran from the bike bath to the yellow loop and the orange loop trails- which is just over 3 miles of tough switchback running - pushed hard. Actually hit some low 7's and high 6's on the trails that I did not think was possible. Felt strong and the shoes made me feel sure footed. Also saw a few Ohio Whitetail deer and a scared a few walkers hiking the trails. Makes it complete. 53 and misty. Easy recovery run. PM - 4 miles between storms. Tough morning so had to settle for an evening bike path run. 66, but not humid. 8 miles, w 13x20s striders @ 3k pace -mostly low 6/high 5's. Active recoveries. I thought the bike bath would be busier. There were some friendly people and high fived a girl as we passed on the way back. She needed motivation it looked like. 48 with a cool drizzle (sorry Joe). Ideal running temps, although there was a some wind for resistance. Not many people out early, but by the end there was some people enjoying the day. I saw of 12 rabbits and was beginning to wonder if I was having too many kale smoothies. Luckily I survived. Legs were tired so I wanted to start very slow and then just get progressively faster. Mission accomplished. 9:36, 9:19, 9:04, 8:57, 8:39, 8:24, 8:13, 8:01, 7:52, 7:42, 7:21, 7:07, 7:05, 7:22, 7:29. At no point did I feel like I really was 'pushing' it, so good deal.